Today about one hundred concerned residents came together in the heart of Geelong, on a freezing cold morning to stand against forced fluoridation. The numbers were good despite very short notice, little advertising and poor weather. 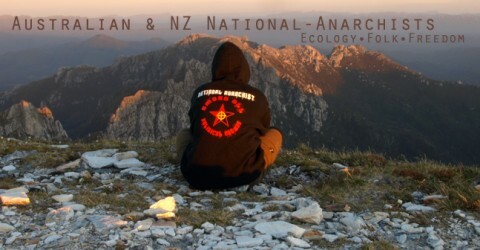 National-Anarchists from the local area participated in the rally and continue to network with organisers. Despite government promises and a vocal opposition, fluoride is to be introduced to water supplies on 22nd June – this is in complete violation of governmental power! There has been no calls from the public to have fluoridated water, government very sneakily and quietly introduced the program and mainstream media have helped promote the propaganda. Geelong residents do not need government to force “medication” upon them, fluoride has no business in our water supply! It is a simple fact that fluoride is a highly toxic chemical and causes serious harm to people sensitive to its effects. Geelong has for a long time been a known fluoride-safe zone, now those residents that are allergic to fluoride will be forced to either pack up and leave or find another, expensive source of water. The alleged benefits of fluoridation are nothing compared to the possible impact it will have on the health and wellbeing of the Geelong people. The rally featured a number of speakers, including the owner of Organic Larder (an organic grocery store in Geelong), Billy Bond, who made clear that the fight will be long and hard but it is our duty as aware and determined people to continue to fight for what is right. A spokesperson from the main campaign group, Barwon Freedom from Fluoridation, also detailed the lies and misinformation surrounding the fluoridation issue and how fluoridation has been completely stopped in Europe. The same will be the case for Geelong! The march proceeded down the streets of Geelong, with chants and banners demanding that fluoridation not go ahead at all. Eventually the protestors arrived outside the doors of the Geelong Advertiser; the newspaper that continually misleads the public at every opportunity. Despite this being the final stop for the march, chanting went on for ages and protestors were clearly determined to make their voice heard for as long as possible. Overall, the rally was a success and the fight goes on. The BAFF group and its supporters have made clear that the date fluoridation commences is not the end of the campaign, it is the date the fight rams up a level and goes on stronger than ever before! We will be there till the end, for our freedom to choose and the health of our future generations.